Anesthesia is a hybrid Indica-dominant Marijuana strain, which as its name suggests has a high sedative power and a high therapeutic value. Indica attributes at all levels, suitable for all kind of breeders. 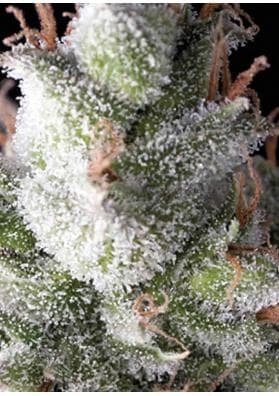 Anesthesia is a hybrid Indica-dominant (90%) Marijuana strain created by crossing two heavy-hitting Cannabis varieties, Northern Lights and Black Domina. The result is a high quality strain with full flavour and extremely potent sedative effects, so handle with care and only smoke it in moderation! In this way, it not suitable for rooky or infrequent somokers. While it's strong effects make it a great choice as a plant for medicinal relief from various complaints, Anesthesia certainly not disappoint in the taste department, with the flavour initially sweet on the palate, later becoming sour on the exhale. It is a plant with all the attributes you had expect from an Indica, vigorous growth, lush deep foliage, moderate height, perfect for selecting a mother plant to take cuttings from if the heavy Indica effect and flavour is what you are looking for. Besides that and during the flowering period, its buds beacme completely covered with resin, to a point that ithey will stick to your hands. In a growing room, Anesthesia develops in a plant between 80-120cm of height and in 50-55 days is able to offer you yields of up to 600 grams per meter square. In the garden it grows a bit more (90-180cm) and in mid-September it will offer you productions ranging from 300 grams and a kilo and a half per plant.